Established in 1925, the Palace Museum is located in the imperial palace of the consecutive Ming (1368-1644) and Qing (1644-1911) dynasties. The magnificent architectural complex, also known as the Forbidden City, and the vast holdings of paintings, calligraphy, ceramics, and antiquities of the imperial collections make it one of the most prestigious museums in China and the world. In 1961, the State Council designated the former imperial residence as one of China’s foremost-protected cultural heritage sites, and in 1987 it was listed as a UNESCO World Heritage site. Situated in the heart of Beijing, the Palace Museum is approached through the Gate of Heavenly Peace (Tian’an men). Immediately to the north of the Palace Museum is Prospect Hill (also called Coal Hill), while on the east and west are the Wangfujing and Zhongnanhai neighborhoods. Ancient China’s astronomers endowed the location with cosmic significance. They correlated the emperor’s abode, which they considered the pivot of the terrestrial world, with the Pole Star (Ziwei yuan)—believed to be the center of the heavens. Because of its centrality and restricted access, the palace was called the Forbidden City. It was built from 1406 to 1420 by the third emperor of the Ming dynasty, the Yongle Emperor (r. 1403-1420) who, upon usurping the throne, determined to move his capital northward from Nanjing to Beijing. Over 200 years later, the Ming dynasty fell to the Manchu Qing dynasty in 1644. Then, in 1911, the Qing were subsequently overthrown by republican revolutionaries. The last emperor, Puyi (who ruled from 1909 to 1911 under the reign name Xuantong), continued to live in the palace after his abdication until he was expelled in 1924. During nearly six hundred years of imperial operation, the palace served as the residence and court of twenty-four emperors. The Forbidden City is surrounded by 10-metre-high walls and a 52-metre-wide moat. Measuring 961 meters from north to south and 753 meters from east to west, the complex covers an area of 1,110,000 square meters. Each side of the rectangular city has a gate. These four gates are the Meridian Gate (Wu men) on the south, the Gate of Divine Prowess (Shenwu men) on the north, and the East and West Prosperity Gates (Donghua men and Xihua men), respectively. Entering from the south, visitors will see a succession of halls and palaces spreading out on either side of the central axis. The glowing yellow roofs of the stately buildings seem to levitate above the vermilion walls. This magnificent sight is amplified by the painted ridges and carved beams of the ancient structures. 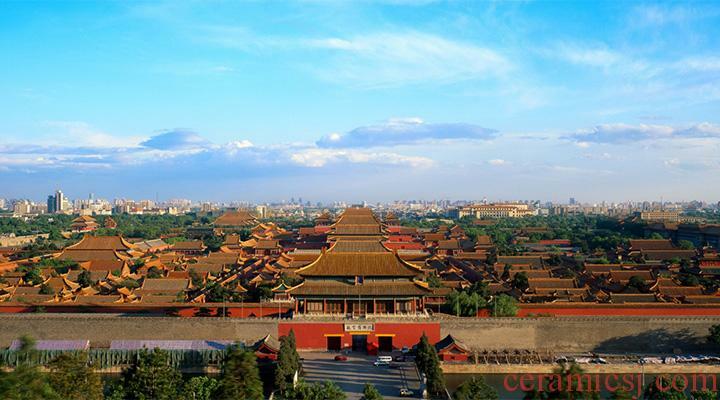 Known as the Outer Court, the southern portion of the Forbidden City features three main halls – the Hall of Supreme Harmony (Taihe dian), Hall of Central Harmony (Zhonghe dian), and Hall of Preserving Harmony (Baohe dian). These three halls are flanked by the Belvedere of Embodying Benevolence (Tiren ge) and Belvedere of Spreading Righteousness (Hongyi ge). The Outer Court was the venue for the emperor’s court and grand audiences. Mirroring this arrangement is the Inner Court, which is the northern portion of the Forbidden City. The Palace of Heavenly Purity (Qianqing gong), Hall of Union (Jiaotai dian), and Palace of Earthly Tranquility (Kunning gong) lie upon the central axis. The Six Eastern Palaces and the Six Western Palaces are private imperial residences found on their respective sides of the main axis. Other major buildings in the Inner Court include the Hall for Abstinence (Zhai gong) and Hall of Sincere Solemnity (Chengsu dian) in the east and the Hall of Mental Cultivation (Yangxin dian), Belvedere of Raining Flowers (Yuhua ge), and Palace of Compassion and Tranquility (Cining gong) in the west. The Inner Court is not only comprised of the residences of the emperor and his consorts but also venues for religious rituals and administrative activities. The far north end of the Inner Court is the Imperial Garden. In total, the buildings of the two courts account for an area of some 163,000 square meters. These structures were designed in strict accordance to the traditional code of architectural hierarchy, which designated specific features to reflect the paramount authority and status of the emperor. Ordinary mortals were forbidden—and most would never dare—to come within close proximity to this imperial city. The Xinhai Revolution of 1911 ended with the abdication of the last emperor Puyi. The provisional government allowed him to continue to live in the Inner Court of the Forbidden City. Meanwhile, all of the imperial treasures from palaces in Jehol (or Rehe—present-day Chengde, Hebei Province) and Mukden (present-day Shenyang, Liaoning Province) were moved to the Forbidden City for public display in the Outer Court in 1914. While confined to the Inner Court, Puyi utilized the vestiges of his dynastic influence to plot his own restoration. He also smuggled out or pawned countless works of art under the pretexts of granting them as rewards to his courtiers and servants or sending them for repair. In 1924, during a coup launched by the warlord Feng Yuxiang, Puyi was finally expelled from the Forbidden City. The management of the palace fell to a committee that was set up to deal with the concerns of the deposed imperial family. That committee also audited the imperial collections. After a year of tireless preparations, on 10 October 1925, the committee arranged a grand ceremony in front of the Palace of Heavenly Purity to mark the inception of the Palace Museum. News of the opening flashed across the nation. Such was the scramble of visitors on the opening day that traffic jams around Beijing almost brought the city to a standstill. According to a twenty-eight volume inventory published in 1925, the treasure trove left by the Qing imperial family numbered more than 1,170,000 items. This collection included sacrificial vessels and ancient jade artifacts from the earliest dynasties of Chinese history; paintings and calligraphy dating to as early as the seventh century; porcelain from the Song and Yuan; a variety of enamel and lacquer ware; gold and silver ornaments; antiques made of bamboo, wood, horn, and gourds; religious statues in gold and bronze; thousands of imperial robes and ornaments; textiles; and furniture. In addition, countless books, literary works, and historical documents were found among the antiquities. All these were divided into separate collections that were placed under the care of designated staff to sort and collate. Exhibition halls were opened to display some of the treasures. The establishment of the museum ushered in new fields of research and academic inquiry, and writers and editors soon began publishing books and journals to report the exciting, new findings. 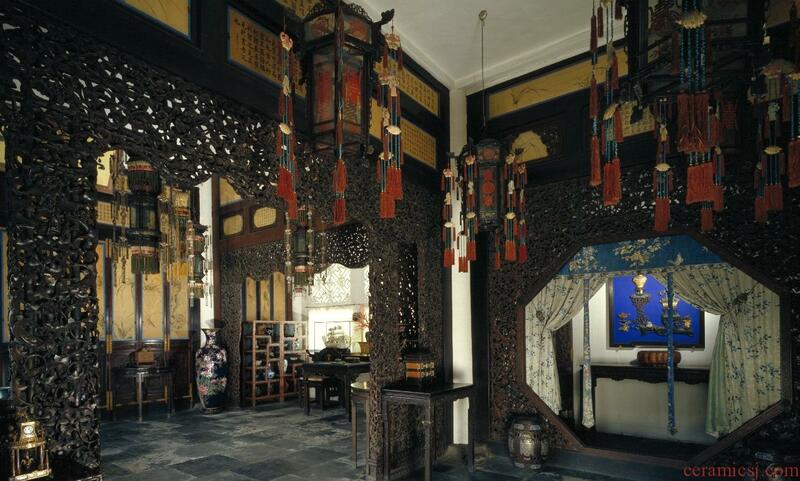 The Palace Museum quickly became a thriving center for scholarly research and public interest. Shortly before the outbreak of World War II, the Japanese had annexed territory in China’s northeast and proceeded to march on Beijing. With this looming threat, the Museum’s authorities decided to evacuate its collection rather than let it fall into enemy hands or risk destruction in battle. In the frantic time from February to May 1933, the most important pieces in the collection were packed into 13,427 crates and sixty-four bundles and sent to Shanghai in five batches. Another six thousand some crates were assembled from the Antiquities Exhibition Institute, Summer Palace, and Imperial College. In 1936, they were dispatched to Nanjing where a depository had been built and a branch of the Palace Museum was to be established. On 7 July 1937, shots fired at the Lugou Bridge (also known as the Marco Polo Bridge) west of Beijing heralded the eruption of the Sino-Japanese War. Within a year, the Japanese had invaded most of eastern China. The treasures stored in Nanjing had to be moved again—this time by three routes to Sichuan, where they were secreted in Baxian, Emei, and Leshan. Only at the end of the war were they consolidated in Chongqing and subsequently returned to Nanjing in 1947. With the imminent victory of the Communist army south of the Yangtze River, the weakened Kuomintang began their retreat to Taiwan. From the end of 1948 to 1949, the Kuomintang selected 2,972 crates to be shipped across the Strait for storage in Taichung. The contents of these crates formed the collection of the Taipei Palace Museum, which opened to the public in 1965. Most of the national treasures remaining in Nanjing were gradually returned to Beijing, although to this day 2,221 crates remain in storage in Nanjing. During this tumultuous decade of war and revolution, none of the treasures were lost or damaged, in spite of the incredible quantity of antiquities. This was largely due to the steadfast commitment of the Palace Museum staff, whose achievement in preserving these treasures was nothing short of heroic. Unfortunately, as a result of this long period of upheaval, some of the treasures were dispersed into various institutions. Over the years, the collection has remained divided. Today, many people still hope for the eventual reunification of the collection and the restoration of its comprehensive representation of Chinese traditional culture. In the early 1950s, shortly after the establishment of the People’s Republic of China, the Palace Museum staff was imbued with new determination and enthusiasm to restore the Forbidden City to its former glory. The Museum’s administration launched a policy of comprehensive restoration. Where previously the dirty and dilapidated halls and courts lay under weeds and piles of rubbish, the palace shined with a renewed vibrancy after some 250,000 cubic meters of accumulated debris were cleared out. In time, the crumbling palace buildings, repaired and renovated, once again displayed their original resplendence. All the tall structures were equipped with lightning rods, while modern systems were installed to ensure fire protection and security. Additionally, the maintenance of the surrounding moat has been a distinct government priority, particularly since the beginning of the reforms instituted during the early 1980s. The collections of the Palace Museum originate from the Qing imperial collection and include ceramics, paintings, calligraphy, bronzes, timepieces, jades, palace paraphernalia, ancient books, and historical documents. During the 1950s and 1960s, a systematic inventory was completed and redressed previous inaccurate catalogues. After the founding of the Museum in 1925, particularly after the founding of the People’s Republic of China in 1949, the collection was further augmented in various ways. For example, many precious artifacts were salvaged from a muddled assortment of apparently worthless objects. After more than a decade of painstaking efforts, some 710,000 treasured pieces from the Qing palace were retrieved. Meanwhile, national allocations, requisitions, and private donations brought more than 220,000 additional pieces of cultural significance to the Museum. These acquisitions made up for the lack of certain aspects of ancient Chinese history in the original Qing collections and included colored earthenware from prehistoric times, bronzes and jades from the Shang and Zhou dynasties, pottery tomb figurines from the Han dynasty, stone sculpture from the Northern and Southern Dynasties, and tri-color pottery from the Tang dynasty. The ancient paintings, scrolls, and calligraphy added to the collections were particularly spectacular. These exquisite additions included Lu Ji’s A Consoling Letter (Pingfu tie) in cursive script, Wang Xun’s Letter to Boyuan (Boyuan tie), and Gu Kaizhi’s Nymph of the Luo River (Luoshenfu tu) from the Jin dynasty; Zhan Ziqian’s landscape handscroll Spring Excursion (Youchun tu) from the Sui dynasty; Han Huang’s Five Oxen (Wuniu tu) and Du Mu’s running-cursive script handscroll Courtesan Zhang Haohao (Zhang haohao shi) from the Tang dynasty; Gu Hongzhong’s The Night Revels of Han Xizai (Han Xizai yeyan tu) from the Five Dynasties; Li Gonglin’s Imperial Horses at Pasture after Wei Yan (Lin Wei Yan mufang tu), Guo Xi’s Dry Tree and Rock, Level Distance Landscape (Keshi pingyuan tu), and Zhang Zeduan’s Life along the Bian River at the Pure Brightness Festival (Qingming shanghe tu) from the Song dynasty. These pieces are all unrivaled masterpieces from throughout the history of Chinese art. Currently, the total number of works of art in the Museum’s collection exceeds 1.8 million. As unremitting as the attempt to recover lost masterpieces has been, the Museum continues to exert efforts to recover certain national treasures. Some of these works include Zhang Xian’s Illustrating Ten Poems (Shiyong tu, Song dynasty), Nai Xian’s calligraphy Poems Reflecting on the Past in the Southern City (Chengnan yonggu shi, Yuan dynasty), Shen Zhou’s landscape handscroll After Huang Gongwang’s Dwelling in the Fuchun Mountains (Fang Huang Gongwang fuchun shanju tu, Ming dynasty), and Shi Tao’s ink bamboo Loudly Calling Yuke (Gaohu Yuke tu, Qing dynasty). The first two were spirited out of the palace by the last emperor, Puyi, on the excuse of bestowing them to his brother, Pujie. These two priceless works passed into other hands, and it was not until the 1990s that they were returned to their rightful place in the Palace Museum collection. Beginning in the 1950s, the Museum’s existing repositories have been completely overhauled to provide humidity controls, insect proofing, and other safeguards for the preservation of the collection. In the 1990s, a new storehouse with a capacity of over 600,000 items was built and included advanced temperature and humidity controls and protections against fire and theft. In the 1950s, a workshop was established for the care of collection pieces. This workshop was expanded in the 1980s into the Conservation Department. The workshop and subsequent department continue traditional forms of craftsmanship and utilize scientific methods in the restoration of damaged art. Over the past few decades, the Conservation Department has attended to as many as 110,000 objects from the Museum’s collection and other public institutions. In addition to continuously refurbishing the main courts and halls, the Museum has expanded the scope of exhibitions by opening new galleries to display bronzes, porcelain, handicrafts, paintings and calligraphy, jewelry, and clocks. Temporary exhibition galleries have also featured a wide range of thematic shows. Furthermore, the Museum has curated traveling exhibitions for museums overseas and hosted visiting international exhibitions. Since the beginning of China’s period of economic reform, an increasing number of exhibitions have been displayed around Asia and in Oceania, Europe, and North and South America. These exchanges have aroused great interest and esteem and played a significant role in promoting international understanding and cultural dialogue. The Palace Museum’s range of publications has created further interest in domains such as the Forbidden City’s history, architecture, and vast cultural holdings. The substantial body of published works includes Famous Historical Paintings in the Palace Museum Collection, Selected Porcelain from the Palace Museum Collection, National Treasures, Palaces of the Forbidden City, Daily Life in the Forbidden City, A Collection of National Treasures, and The Complete Palace Museum Collection (in 60 volumes). There are also two periodicals, namely, the Palace Museum Journal and The Forbidden City. Although the Forbidden City used to be an impenetrable fortress, the imperial palace is now a public museum. The collection, displayed in gallery halls throughout the complex, is becoming increasingly more accessible with digital technologies. The Museum’s website, established in 2001, is dedicated to presenting a “Digital Palace Museum” by which the wealth of cultural heritage contained in the Forbidden City may be effectively spread worldwide. With rich collections representing the broad spectrum of 5,000 years of Chinese civilization and the 600 year history of the Forbidden City, the Palace Museum has seen many developments since its founding in 1925 and looks forward to carrying on the legacy of the past for future generations. Now, as always, the Palace Museum is committed to the preservation of national heritage and the goal of serving as a model for museums around the world.